In honour of the Raspberry Pi I wanted to make a Raspberry Pie, I tried to do this by looking up a recipe on the rPi plugged into the TV but page loads were too slow (still running debian squeeze rather than raspbian so not taking advantage of the speed increases associated with that). So I decided to just experiment and throw things together until they looked about right (the temporary absence of scales meant that being accurate was difficult). When you are making something yummy out of components which are all yummy there is only so far you can go wrong. There was a little less pastry than would have been optimal made using flour, unsalted butter and a little bit of water (cribbing from Delia’s instructions but without any accuracy). I left it in the fridge for well over the half an hour I had originally intended before rolling it out. This was cooked for ~10minutes at 180℃ (might have been better to leave it longer). 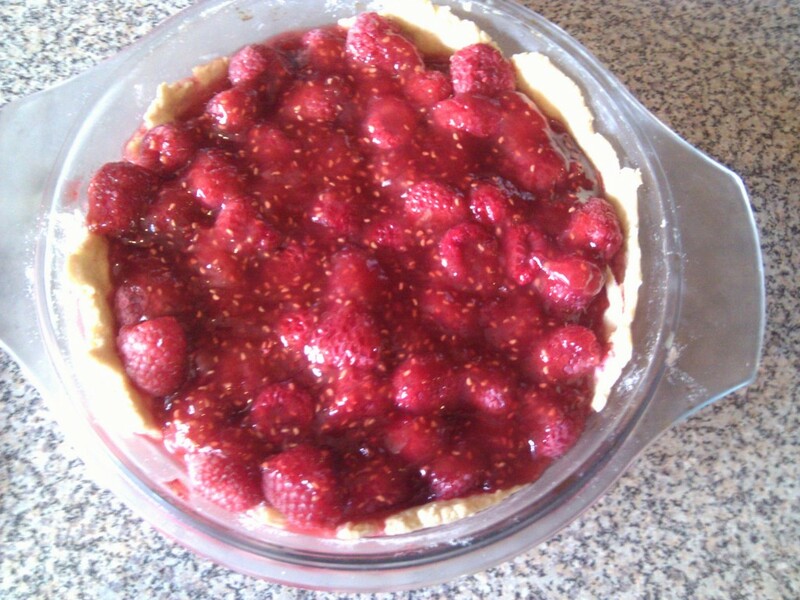 I used two punnets of raspberries most of which went in raw on top of the cooked pastry but ~1/3 of a punnet went in with some sugar (mainly castor sugar but a little bit of soft brown which deepened the colour) and two heaped tablespoons of corn flour and a little big of water this was stirred vigorously on a hob such that it did a lot of bubbling until it turned into a rather nice thick goo with all the bits of raspberry broken up (looked very jam like). That then got poured on top. I left it in the fridge over night as it was quite late by this point and we ate most of it for lunch. 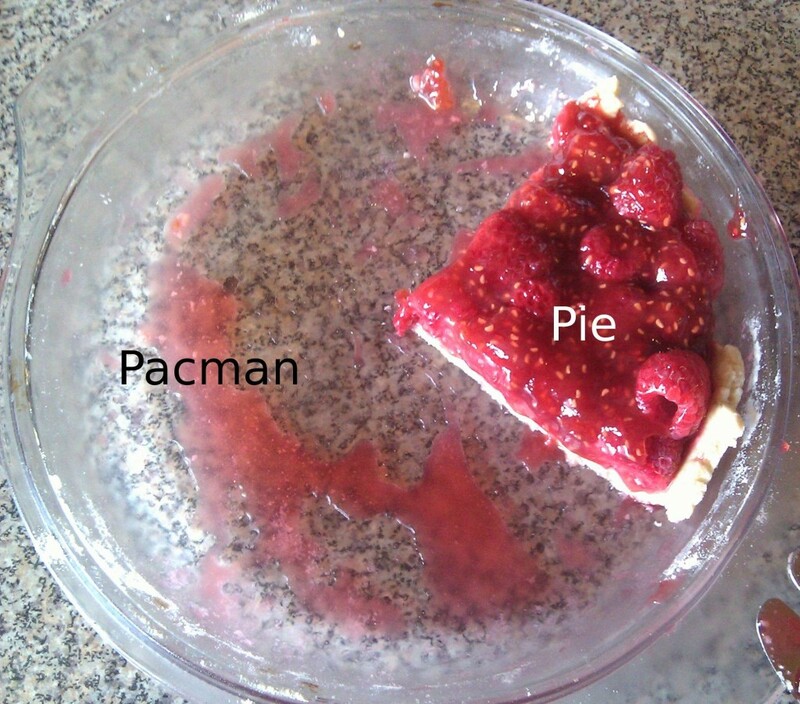 The only good pie chart, fraction of pie dish which looks like pacman, fraction which is pie. It has been rather a long time since I last made cake, but on Wednesday I made one and people seemed to like it. My cooking is frequently somewhat experimental and this was one of those occasions so I will record the interesting bits. None of the recipes I looked at put marshmallows in the cake mix before baking the cake. The reason for this is that they float to the top and explode. However I put a ring of mini marshmallows around the bottom edge of the cake tin before pouring in the cake mixture (A mixture using 200g dark chocolate as its main ingredient and very little flour) this make the the edge of the cake more chewy and resulted in an entertaining crown of exploded marshmallows around the edge. I put most of the marshmallows into the ‘icing’ which was ~150g of very dark chocolate with a couple of bags of marshmallows melted in (glass bowl in boiling water). It takes a long time to melt the marshmallows in with the chocolate and requires a lot of stirring. You want enough chocolate in that it can transfer the heat to the marshmallows properly. I kept mixing until the consistency was a completely even sticky brown. It might be better to stop slightly earlier leaving lumps of partially melted in marshmallows in the mixture to add some more variety to the texture. Decorating with dark chocolate drops might also increase the nom factor. I should fix my camera.